Pancakes! Is there anyone out there who would turn down a stack of flapjacks on a Sunday morning? Didn’t think so. Luckily, a pancake breakfast doesn’t always have to mean a carb-blowout--you just need to take the right approach. 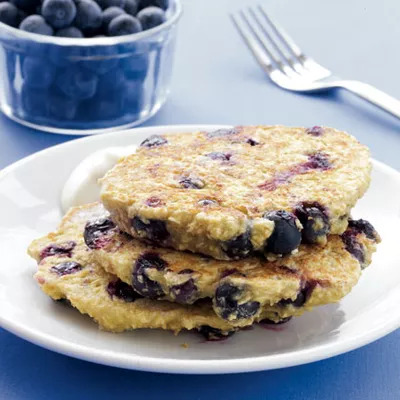 Enter this recipe for blueberry oat pancakes with maple yogurt. It may sound decadent, but thanks to some smart swaps and wholesome ingredients, this dish is actually good for you. One serving (three whole pancakes!) packs 26 grams of protein, 6 grams of fiber, and a powerful punch of antioxidants. You'd be hard-pressed to find a better breakfast option. Guilt-free brunch? Sign us up.